By this time, you might also be thinking of preparing healthier food at home. The problem is you still want to enjoy fried food, but it is oily. There is another way with the air fryers. 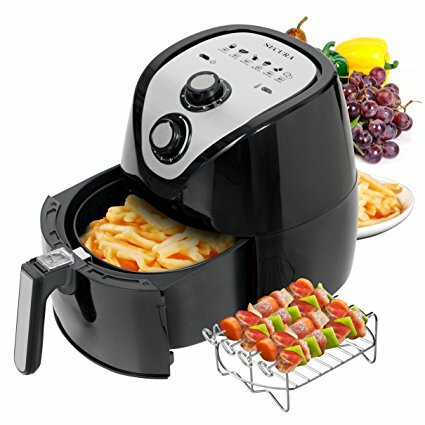 With this fantastic kitchen appliance, you can eat healthier and still enjoy french-fries, KFC, and even steamed food. With the exclusive design, the device prepares food by cooking it with circulated air. The footprint is smaller, is more compact, and looks magnificent standing in the kitchen. The chance is it might even replace your oven and microwave oven. You can buy the unit in different sizes to make meals for small to large families depending on which one you buy. 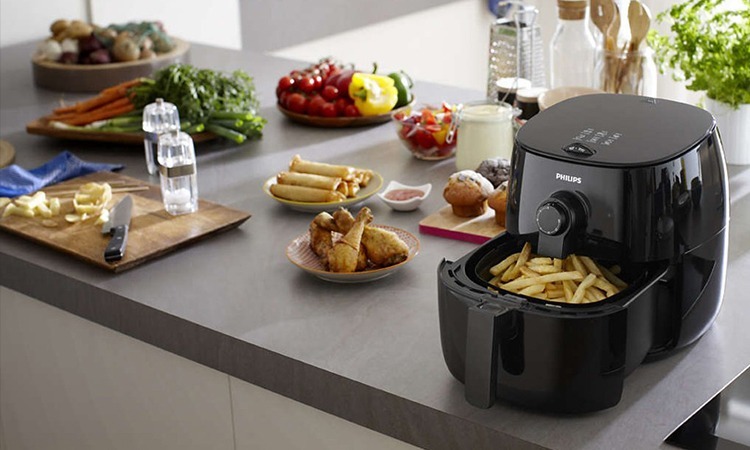 If you feel, you need to start eating healthier look at our air fryers reviewed here? You can find one suitable for your lifestyle and kitchen right here in 2019. 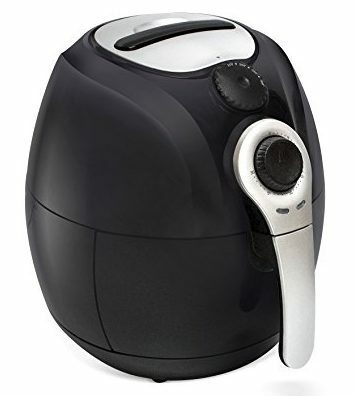 For a versatile air fryer with a digital display, you need the FrenchMay. You can cook up a storm quickly, and it tastes delicious. You can bake, fry, grill, and roast in this innovative appliance. Another added benefit is the device needs no preheating with the airflow technology used in it. You can add up to 3.7qts of fresh or frozen food with ingredients to enjoy a home-cooked meal. According to different users, it cuts their cooking time when it comes to preparing meals. 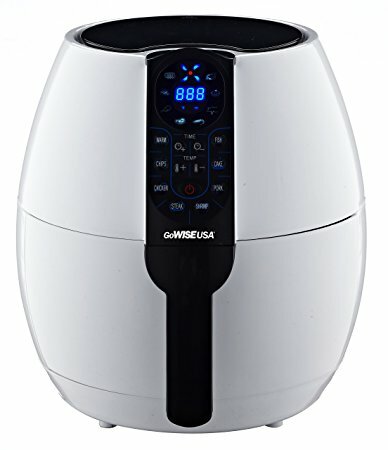 Although the GW22633 air fryer from GoWISE seen in a white color, you can buy it in other colors as well. Forget about soggy foods with this appliance as it fries, grills, bakes, and roasts without oil. The basket holds 2.75 Qt. You can quickly cook two legs and two thighs simultaneously. The uniqueness is the basket that has a safety button that prevents food from spilling out inside. You can even warm your foodstuff again, and it will stay nice and crispy to eat. Consumers have said they have made chicken wings, frozen egg rolls, banana bread and more in this appliance. Everyone knows the Black & Decker for the power tools and handy accessories. 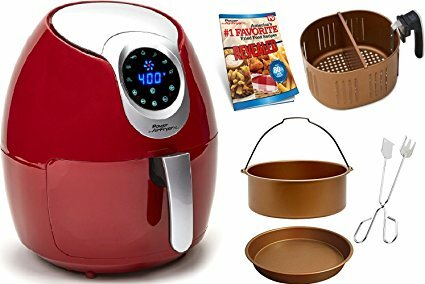 Here you can see another innovative invention from them the Purify air fryer. Enjoy eating scrumptious crispy meals without feeling guilty about your weight. The capacity of the appliance is 2-liter or 2.11 Qt. For a family of two, the HF110SBD is perfect. To use the device you need to flip the food as it browns from the top. The uniqueness is that the fat falls through to the bottom for ease of cleaning. 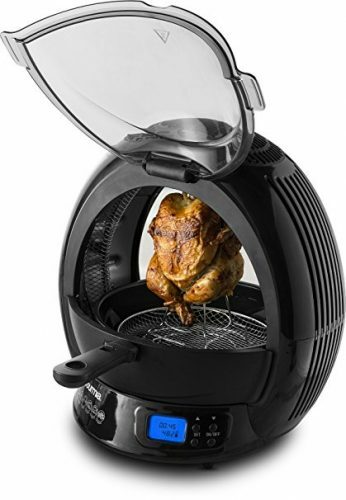 For an unconventional way of cooking, you need the air fryer from Avalon Bay. The trendy design will look grand on your kitchen top it is available in different colors. In the appliance are a non-stick basket and the oil drops through to the lower chamber while cooking. The heating element comprises of stainless steel, and it works with analog knobs. The thermostat and times adjustable and switches off after it is finished cooking. You can reheat leftovers and cook different foods in the 3.4 Qt basket. For easy oil-free cooking, you need the air fryer from Power advertised as the XL Deluxe. The easy load basket makes preparing crispy chips and other foods a breeze. With the digital display, you can select your cooking preparations from seven preset programs. The appliance can bake, grill, roast, fry, and heats up to 400-degrees. Heating up is not a problem with this device as it works with turbo-cyclonic power. Users are more than pleased with the unit as it prepares crispy fat-free food. Do you want to switch to making healthier food and still enjoy those crispy fries? You do then look at the Big Boss air fryer with its oil-less design. With the transparent glass display, you can see your food frying and observe the process as it takes place. Even if the entire appliance has a see-through design, you can still buy it with different color details. The benefit when purchasing this device is you can supply your whole family with delicious meals. 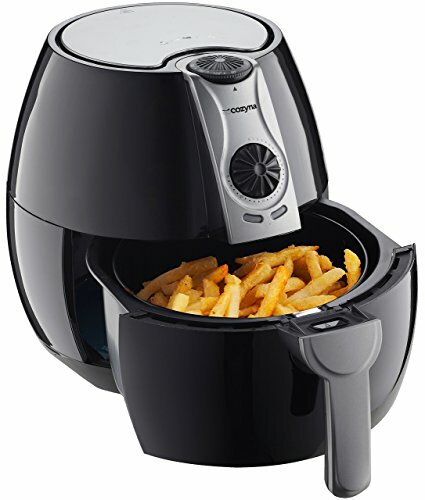 For creating healthy food with a crisp, you need the air fryer from Cozyna. However, you need to note that it works like a convection oven and does not deep fry. The design of the appliance is small, has a powerful fan, and looks great in any kitchen. The basket has a flip-switch to disconnect it and is fantastic and makes removing it more manageable. The display is simple to use and has a luminous blue light. There are two indicators one to heat it up, and the other one is the timer. If you want to start eating, healthier this is the way to go. 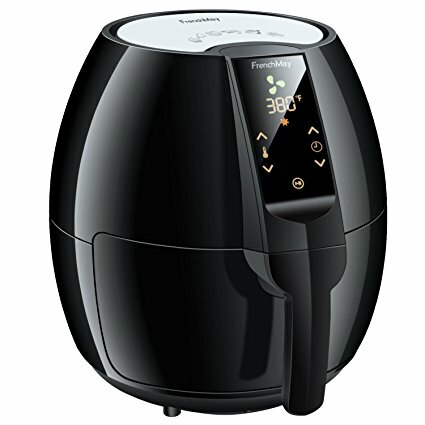 The Gourmia air fryer has a vertical digital display design. You can make multiple foods in the appliance and roast chicken. The device has a sleek design and is compact to fit on any tabletop in your kitchen. The GMF2600 stands out from other air fryers with the dual surrounding heat source. The accessories included you can remove for ease of cleaning. There is view window and the temperature controls adjustable. Secura offers you two air fryer models the 3.4 Qt and an X-Large one. The appliance uses rapid hot air to cook the food and has a top grill as well. There is a 60-minute timer that has an auto shutoff feature with a heating/power indicator light. You can set the temperature control to different settings from 180-degrees to 400-degrees. The good news is that Secura backs their product with a two-year warranty. Do you want to join the air frying revolution? You need the Simple Chef Airfryer to prepare your healthy dishes. 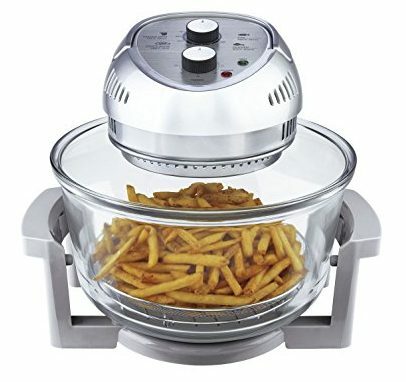 As with all the air fryers reviewed here, this one also has adjustable temperature control and timer. The accessories you can remove to wash in a dishwasher as the parts constructed of durable material. The basket capacity is 3.5 liters. 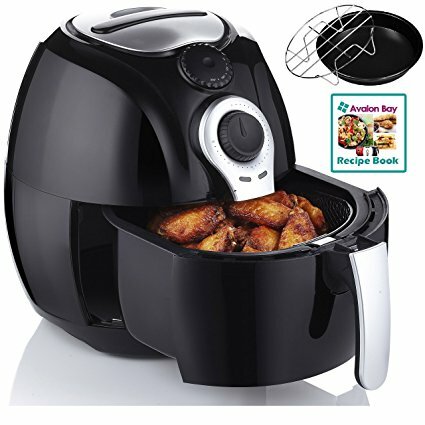 For a multipurpose appliance to use in the kitchen you, need one of the best air fryers reviewed here. 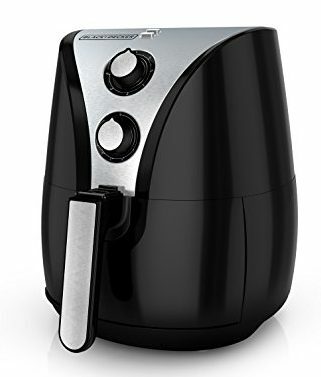 2019 has loads of air fryer models to you, but we hope that you can find a suitable one right here on our list. Enjoy oil-free cooking of your favorite foods and even steam your vegetables. Bake up a batch of brownies and prepare cupcakes in no time. So go ahead and buy one you will not be disappointed. The great thing is you can enjoy your food without feeling guilty.